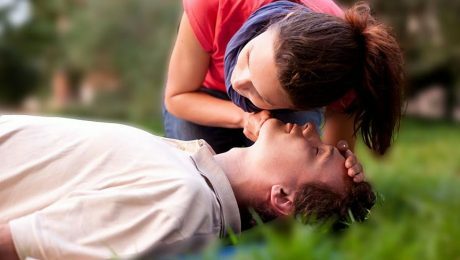 Bystander cardiopulmonary resuscitation (BCPR) has a significant impact on survival rates when performed on cardiac arrest patients outside of the hospital. To be the most effective, however, BCPR needs to be administered quickly and include the following events: immediately recognizing cardiac arrest, calling 911, performing CPR focused on chest compressions, and defibrillation with an automated external defibrillator (AED). CPR keeps blood flowing to the major organs of the body, including the brain, and using and AED will restart the heart. These procedures need to be performed immediately after the patient collapses because the chances of survival decrease rapidly with each minute that passes.